Q. My neighbor drives an ancient, beat up pickup truck. The truck is disgusting to look at, but what concerns me most is the putrid-smelling mulch that he hauls home from our town's DPW garage and spreads around the base of the lilac hedge that separates our properties. The stench is overwhelming and I'm afraid that the bugs and diseases that must infest this stuff will discover my beautiful perennial garden. What can I spray on my perennials to protect them from potential ruin? A. Municipal mulches are made mostly from ground tree branches, shrub prunings and relatively clean construction debris set out at the curb, at left - maybe even stuff that you've set out for collection? Because plant diseases and insect pests are pretty "host-specific," a disease infecting the leaves of say, a lilac, can't infect the leaves of herbaceous perennials like daisies, peonies, coneflowers, hostas, etc. Also, infectious diseases and insect pests thrive in mainly live wood and leaves. Since the brush ground into mulch is no longer alive, diseases and insects rarely persist for long. Also, the interior of municipal mulch piles (and commercial mulch piles too, for that matter) get downright hot - upwards of 160°F to 180° F! These temperatures are high enough kill almost all potential diseases, insect pests and weed seed. My greatest concern with all mulches, be they municipal or the brightest-colored commercial mulches, is the potential for them to become "sour" if stockpiled improperly. 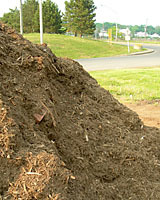 Sour mulch is created when the center of the pile becomes so compressed and/or wet that there is no oxygen, that is, it becomes anaerobic. When this happens, bacteria that thrive in low oxygen environments produce alcohols, ammonia and/or hydrogen sulfide (which has a rotten egg odor). These byproducts of anaerobic decomposition can "burn" the leaves of plants in beds in which the sour mulch is applied. Therefore, it's always a good idea to let mulch air out for a day or two to stop any anaerobic decomposition that may be occurring, before applying any bulk wood mulch to your landscape or garden plantings. Even after making this recommendation, however, let me say that rarely are plants actually killed by sour mulch. And, the byproducts of anaerobic decomposition won't harm plants in nearby beds. So, I suggest you relax. While your neighbor's mulch - and truck may not be to your liking, neither poses a threat to your garden! Oh, a couple of final thoughts. First, remember that mulch should never be more than three inches deep, and it should never be piled up against the trunks/stems/crowns of trees, shrubs and/or perennials. 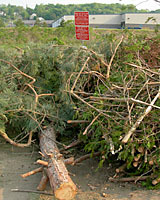 At left, more than eight inches of shredded wood mulch covering the entire root system of this young tree contributed to its death less than two years after its installation. And, as a quick guide to mulch quantities, one cubic yard of mulch/compost will cover 100 square feet to a depth of three inches, 150 square feet to a depth of two inches, and 300 square feet to a depth of one inch.